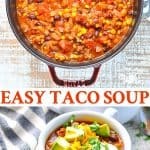 Simmer a pot of easy Taco Soup on the stovetop or in the slow cooker for a healthy and satisfying dinner with just 10 minutes of prep! 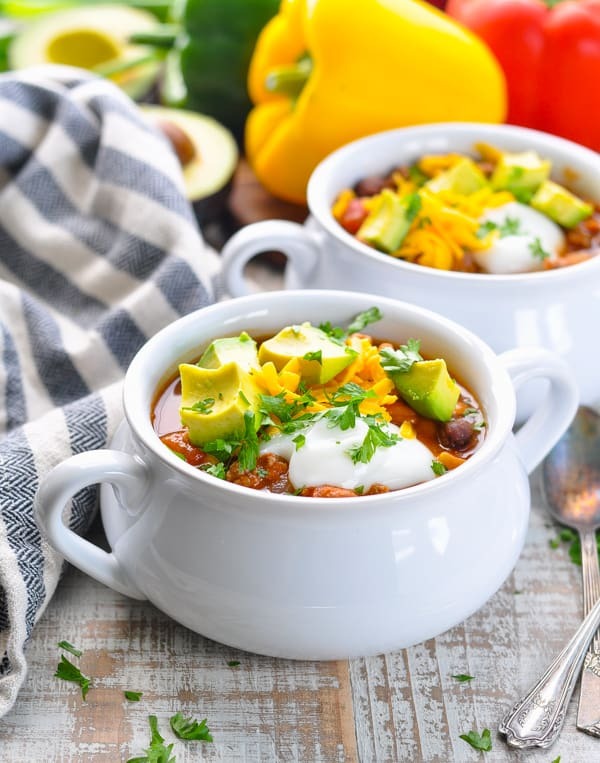 Simmer a pot of easy Taco Soup on the stovetop or in the slow cooker for a healthy and satisfying dinner with just 10 minutes of prep! 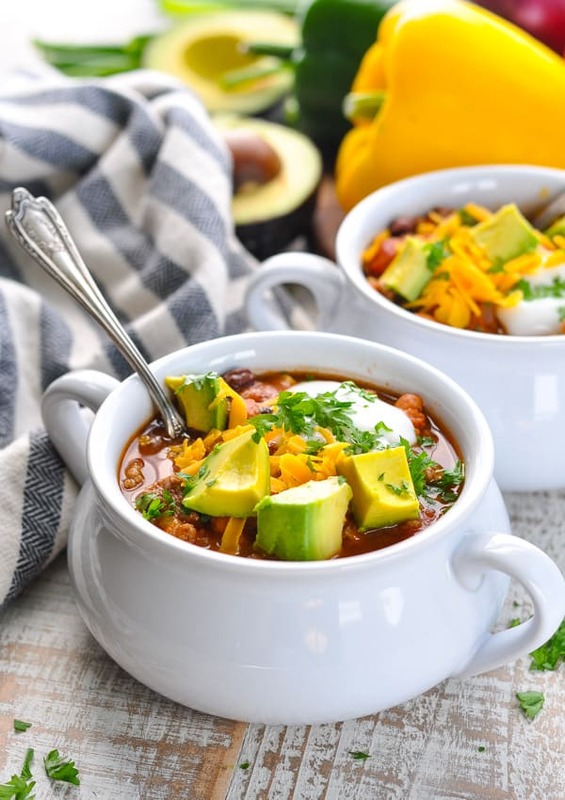 If your family loves Taco Tuesday, then they will adore this cozy twist on the classic meal. 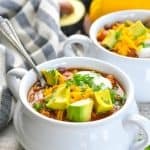 It’s so fun to adjust our cooking as the seasons change, and an easy Taco Soup recipe is my favorite way to embrace the turning leaves, the cooler breeze, and the chilly temps that are on the way. In the summer we were all about taco salads, skinny taco stuffed peppers, and dump-and-bake chicken tacos. But now? 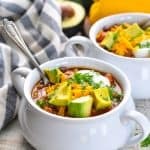 Now, all I want to do is wrap my hands around a warm, cozy bowl of this thick and hearty soup (garnished with all of the toppings, of course)! My recipe is a quick option that only requires about 30 minutes of simmering on the stovetop. It’s perfect for those nights when you haven’t planned ahead and you didn’t set a slow cooker earlier in the day. That said, if you prefer to use your Crock Pot for a hands-off version, check out those instructions below. It works both ways! 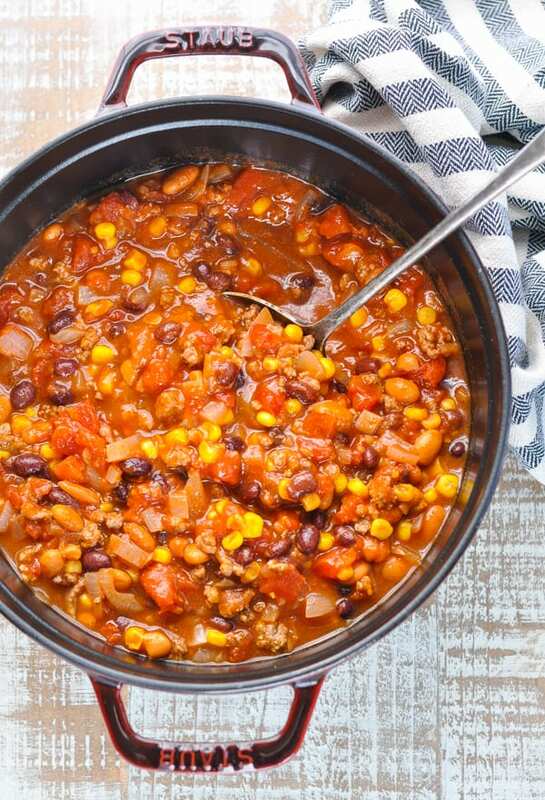 Whether you make your taco soup on the stovetop or in the slow cooker, the process is basically the same: start by browning the ground beef and onion in a pot. Then simply add the remaining ingredients and allow the soup to simmer. On the stovetop, the soup only needs about 30 minutes. 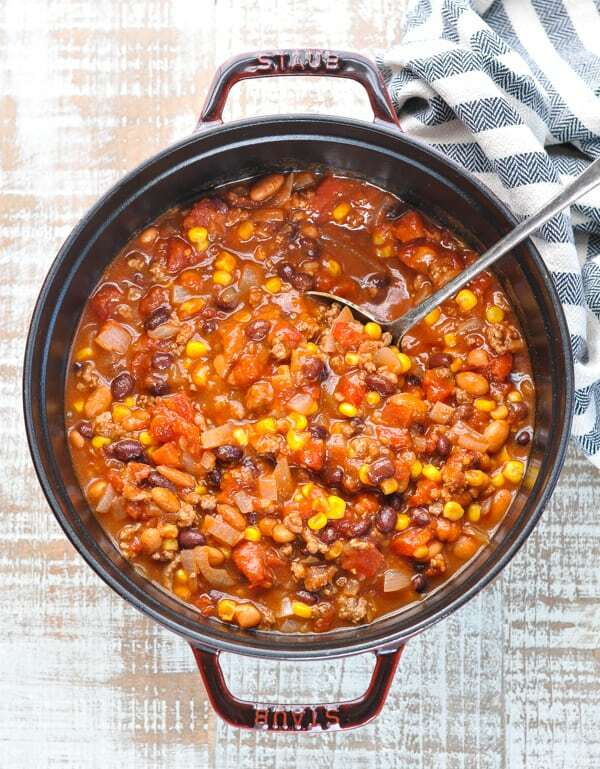 If you choose to transfer the ingredients to your slow cooker, you can allow the soup to simmer on LOW for up to 8 hours (just like a chili). 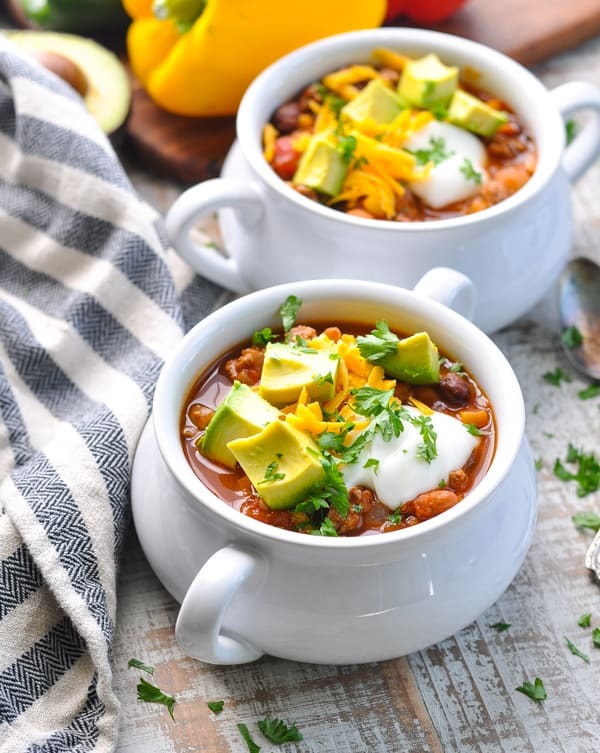 Since the slow cooker is covered, you will want to reduce the amount of water that you use from 3 cups to 2 cups to account for the condensation in the pot. You can always add a bit more at the end, if desired! Brown ground beef and onion in a large Dutch oven. Drain off the fat. Add remaining ingredients and bring to a simmer. Simmer, uncovered, for 30 minutes. 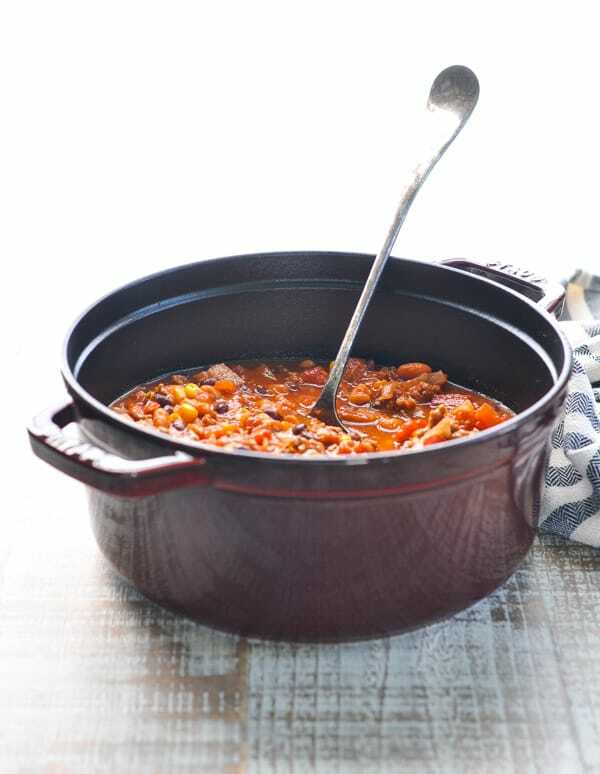 Brown ground beef and onion in a large skillet or Dutch oven. Drain off the fat. Transfer beef and onion to a slow cooker. Add remaining ingredients, but only use 2 cups of water instead of 3. Cover and cook on LOW heat for 6-8 hours or on HIGH heat for 3-4 hours. If you want a thinner soup, you can always add extra water to the pot as the soup is cooking.